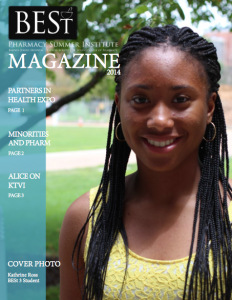 The BESt Pharmacy Summer Institute Magazine is designed to celebrate the accomplishments of our students and promote a vision of excellence for all students from a minority perspective. The following pages represent the passion and work of BESt Summer Pharmacy Institute Students. BESt is a partnership between Barnes-Jewish Hospital, Express Scripts and the St. Louis College of Pharmacy. The mission of the BESt Pharmacy Summer Institute is to expose and prepare local multicultural students for a future career in healthcare, with an emphasis in pharmacy. The mission is executed with a model that combines academics, exposure, and professional development.